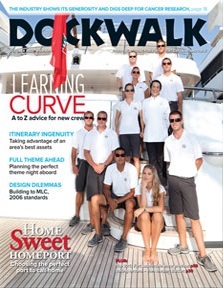 Extra Extra, read all about it: The October 2013 issue of yacht-crew magazine Dockwalk is available online! Along with the always-fun-to-peruse, full-colored pictures of yacht crew both at work and at play, this month’s issue includes an “A-Z Guide for Green Crew” geared toward newbies in the industry (p 37). Green yacht crew, take note! Written by former crewmember, Alex Speed, this guide is chock full of must-know topics and tips to insure an easier time landing your first job on a yacht. From the “A-Z Guide for Green Crew” article in Dockwalk October 2013 by Alex Speed, p. 38. What a surprise to stumble across that while reading this month’s issue! Yacht stews theme partying it out! Participants in the 2nd Annual Perfect Setting Tabletop Challenge (2009) presented each year by Yacht Next at the Fort Lauderdale Boat Show. Also in this issue is a wonderful article on how to plan and execute THEME NIGHT parties for yacht guests. Shockingly, a poll in this issue had 49% of the respondents say their yacht does NOT do theme nights. If you’ve read The Insiders’ Guide to Becoming a Yacht Stewardess (where I champion the idea of theme night parties on yacht charters and even give a slew of fun ideas), then I’m sure you can imagine my reaction: “Blasphemy!”…. Okay, and maybe I also said “WTF?”! So, that just means more stews need to check out this great article on theme-night parties (p. 49) and how to plan and execute them for yacht owners and (especially) charter guests. Going out of your way to add these special touches could very well boost your tip! It’s also a chance for you to exercise a bit of creativity on the job. UPDATE: I’ve since written a post with over 18 different party themes for yacht stewardesses. Check it out here. October’s Dockwalk also has an outstanding preview guide to FLIBS (the Fort Lauderdale International Boat Show), coming up at the end of October. That means yacht-crew job hunt season is on! Whether you’re new crew or old, check out Dockwalk’s guide to FLIBS (p. 58) to see what yachts are attending the show and when all of the crew networking events, seminars, and yes, CREW PARTIES are taking place. Other topics in the October 2013 issue include an article about how the new MLC 2006 regulations are going to affect the design of crew accommodations (p. 80) and an article about the launch of the 55-meter Azimut-Benetti, M/Y Ocean Paradise, captained by the legendary Captain Gui Garcia (p. 32). And much, much more. Indeed, this October 2013 issue of Dockwalk is PACKED. Be sure to check it out!